The Michelin Challenge Bibendum is an annual event run by the French tire company aimed at promoting the development of sustainable mobility. 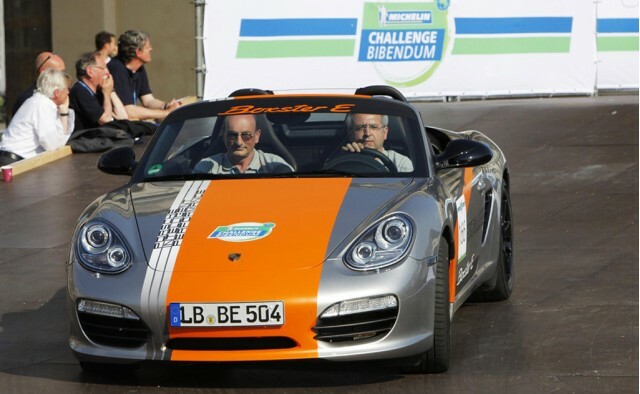 At this year’s event in the German capital of Berlin Porsche rolled out its Boxster E electric car prototype, revealing a few more saucy details about its testing schedule and zero-emission future. Porsche is currently testing three different Boxster E prototypes as part of the “Model Region Electro-Mobility Stuttgart” large-scale trial to explore the everyday practicality of electric cars and how they are used, especially in terms of driving and battery charging. Common to all three prototypes is a mid-engine layout, which is retained from the production Porsche Boxster. Benefits of using this platform for electric car testing have been its relatively low weight, packaging attributes and low drag. Also common is an Active Sound Design system that provides drivers with acoustic feedback as well as alerting pedestrians and other road users. When it comes to the drivetrain, however, things start to change. The first Boxster E prototype features a twin electric motor drivetrain with constant mesh gearboxes that act on the front and rear axles. In this way, the Porsche Boxster E features an all-wheel drive layout without the weight penalties of having drive shafts and differentials. To ensure stability and traction, a central electric control unit looks after the synchronization of the two electric motors and controls the drive torque distribution between the axles. Peak output comes in at 180 kW (241 horsepower) and 398 pound-feet of torque, with maximum engine speed coming in at 12,000 rpm. This guarantees true sports car like performance, with the 0-62 mph dash taking just 5.5 seconds. Top speed is limited to 124 mph, more than enough for public roads, and is achieved without any gear change at all. Additionally, the high power output of the two motors offers a second advantage: it means more recovered power is available because more energy can be recovered during braking and thus an increase in overall efficiency. The second and third Boxster E prototypes only feature a single motor on the rear axle and therefore deliver half the output, 90 kW (120 horsepower) and 199 pound-feet of torque. Understandably, these models are considerably slower, taking 9.8 seconds for the 0-62 mph dash and with a top speed of just 93 mph. 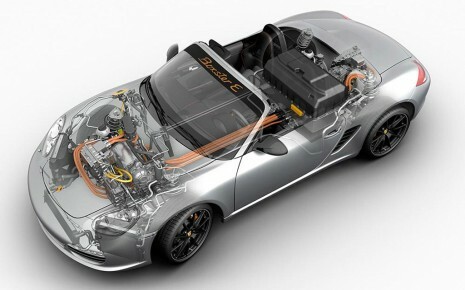 The heart of the new Boxster E prototypes are their lithium-iron-phosphate based traction battery, which weighs up to 750 pounds and sits where the internal combustion engine normally lies in the production Boxster. The overall weight of the Boxster E prototype is just over 3,527 pounds. Each of the battery’s cells has a nominal voltage of 3.3 V and an individual capacity of 20 Ah. Its energy content is 29 kWh of which approximately 26 kWh are available for use. Its maximum power output is 240 kW, or 60 kilowatts more than the all-wheel drive Boxster E draws under full load. The battery and power unit components are connected to two water cooling circuits. Based on the European combined cycle, the combined energy from 440 individual cells is good for approximately 107 miles of driving range when fitted in the rear-wheel drive prototypes. Charging takes approximately nine hours using a regular household power outlet but Porsche promise that quicker times are possible using a rapid charging function currently in the works. Will we see the Boxster E on sale in a few years? At the moment it’s tough to say, since Porsche maintains that the three electric cars taking part into the Stuttgart electric vehicle study are nothing more than rolling test-beds. For now we’ll just have to wait. But if you’re really itching for an electric Porsche, there are companies like Germany’s Ruf that are already offering electric Porsche 911 conversions for sale. Leafhacking Battery Mod Gives Extra Range, But At What Cost?